Lissa Randall's future was bright with academic promise until the tragic accident that took her mother's life--and brought her own plans to a screeching halt. Eighteen months later, she still can't get back behind the wheel. A casual recommendation to Ev McAllistair's driving school sets in motion a cascade of events... until Lissa begins to wonder if maybe, just maybe, life isn't as random as she's thought. Set against the breathtaking backdrop of Lookout Mountain, TN, Words Unspoken weaves together a vibrant cast of characters whose intertwining stories of courage, choice, heartbreak, and hope will hold you captive until the final page. 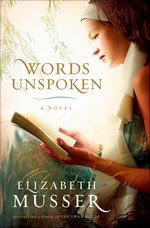 Words Unspoken is a moving novel that made me take a good look at myself. It takes the reader on a journey your heart will not soon forget.